vienna beef Archives - Burgers, Dogs, & Pizza, Oh My! Part of the Grandma’s “empire” of five restaurants in the tourist-laden section of Duluth, MN, Grandma’s Boxcar is a seasonal adjunct to the original Grandma’s Saloon and Grill (menu). Located in the parking lot of one of Duluth’s premier attractions, the aerial lift bridge in Canal Park, the Boxcar is your destination for light casual fare, including Vienna Beef hot dogs and premium ice cream. The competent and engaging Ashtyn serves up the season’s first authentically dressed “Chicago style hot dog” to Minnesota Burger Reporter Kawikamedia. I don’t know about you, but I’d sure like to have a bite of that! Not a review, per se, just a note that if you’ve been running all over the Portland metro area looking for a genuine Vienna Beef hot dog from Chicago, look no further than Jamie’s Chicago Dogs cart at 2nd and Main in downtown Hillsboro. As far as I know, Jamie is the only guy peddling Vienna dogs in all of Oregon! Jamie is on site from 10-3 M-F, weather permitting. He’s got the real deal poppy seed buns, too, and if you’re not in the mood for a regular dog, try one of Vienna’s polish sausages. Jamie’s whole story is here. Kawikamedia and the Minnesota Burger Posse ventured over the big bridge the other day, and alit at Gronks Bar & Grill way out in the boonies of Superior, Wisconsin. Gronks has been featured on a number of the food television shows, “famous” for their giant burgers. While overall, a satisfactory experience was had by all, and they said they would try it again, some of the party attested to a bit of overzealous cooking on the burger and ribs. They reported the onion rings “had promise”, and the Vienna Beef Chicago dog was served with all the correct Chicago trimmings. Photos below by Kawikamedia. Menu reprint from Gronks website. Original Coney Island, is still selling dogs, but new owners have made a few upgrades recently. The vintage appearance (even the original ceiling) have been left intact, but the interior has been spruced up, and the walls decorated with memorabilia. But perhaps the biggest change, is that after 90 years, Original has joined the ‘major leagues’ of hot doggers, by adding Vienna Beef products to their menu. Vienna, from Chicago, is unquestionably the king of hot dog suppliers, the preferred dog of weenie wizards like moi. Minnesota Burger Report Kawikamedia and his burger posse stopped into Original recently, and raved about the authenticity of the natural casing Chicago style dog, adorned with all the right condiments, including the trademark neon green relish, nestled in the appropriate poppy seed bun. They also sampled the skinless Vienna with Original’s coney sauce, and the Italian beef sandwich as well. For those unfortunate readers who have not had Italian (or Chicago) Beef, it’s tantamount to a garlicy French dip, and is goooooooooooooood. For extra joy, have them dip your buns into the au jus. You can check out Original’s menus, breakfast, lunch and dinner, on our menu page. "Hat Up" for Hot Dogs! 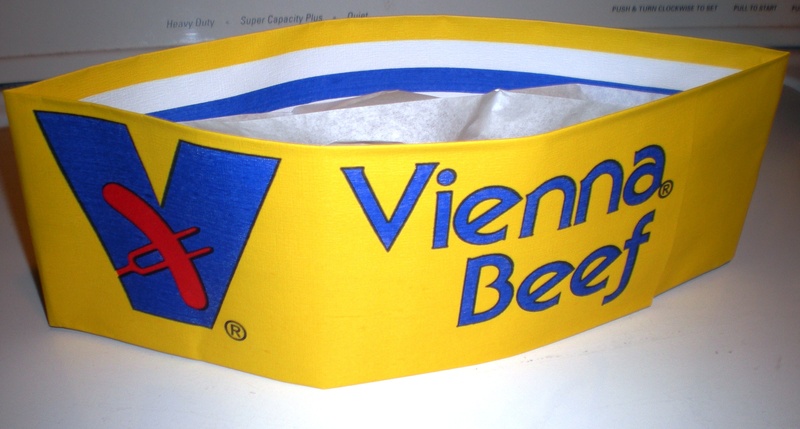 Reducing my inventory of dog and burger merchandise, you need these Vienna Beef paper hats for your summer cookouts! Get 3 for $5 plus a buck for shipping. Mailed by USPS same day as your order! One size fits most. Secure purchase thru PayPal.